Today we received an email request for some real estate advice and it raises the question on what home sellers should do when they know that a move is imminent, and specifically, when you should put your house on the market. I was wondering if you could answer a question for me via email. Our family is planning to move outside of Tallahassee in the summer of 2012 (give or take a few months). Our home is in [northeast Tallahassee]. We realize that the market is slow right now and see many homes remain on the market for quite some time. We are wondering at what point we should put the house on the market, realizing it will likely sit for a while and realizing that we are hoping to move next summer. This is a great question, as it shows that there is an awareness of market conditions that might not have been so just a few years ago. This home seller plans on moving and wants to know the best time to put your home on the market. The first thing I would address is the fallacy of "market time" and the fact that it "will likely sit for a while" on the market. As long as a home is within a price range with decent liquidity, an aggressive market plan combined with the right asking price will get the home sold immediately. It no longer takes months to expose a home for sale, so my first advice on when to put your home on the market is to understand that if you hire the right real estate company and follow the advice given, you will sell your home when you want to sell it. The second point to mention is that they you should study the current market conditions in order to make a decision on when to put your home on the market. If you sell a home now, then almost certainly you will get a higher price than if you wait a year. 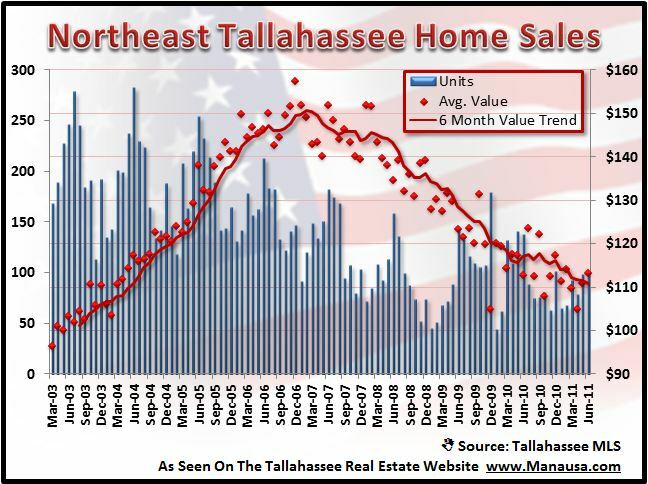 The following real estate graph shows home sales and home value trends in Northeast Tallahassee. The blue lines in the graph show the number of homes sold in Northeast Tallahassee each month, while the red diamonds show the average home value each month. The red line is a six month trend of home values, and we can see that values are continuing to decline. So, using some rough math, home values are down about 5% since this same time last year, and if the current trend continues. a Northeast Tallahassee home (using an estimated size of 2,500 square feet) would drop another $12,000 to $18,000) over the next year. If the home owner sells now, this money could be saved, but this would require an additional move to a rental property for the remainder of the year. This move will have costs involved as well, but would be far less than the money that will be lost due to depreciation. Ultimately, the answer to when to put your house on the market lies in the balance between convenience and cost. My recommendation for this reader is to sit down with a trusted Tallahassee real estate broker who can do an in-depth study of the market conditions in her specific Northeast Tallahassee neighborhood and help her review all of the options available. Even if the plan will be to move in a year, there are too many benefits of putting the plan together now to just push this off for another 6 to 12 months. Knowing when to put your house on the market is as simple as making a plan.